Swaps the perk position and requirements of Orcish and Dwarven smithing perks, and swaps the armor values of Orcish and Dwarven armor sets. The purpose of this mod is to prevent Dwarven armor from being outclassed soon after if not even before ever reaching a Dwemer ruin. 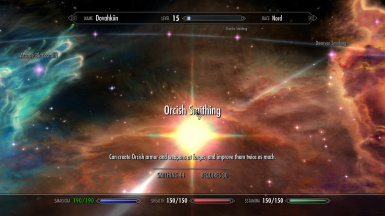 The Orcish Smithing perk now follows Steel Smithing and requires a smithing skill of 30. The Dwarven Smithing perk now follows Orcish Smithing and requites a skill of 50. The Orcish base armor ratings are now 18 (helmet), 34 (armor), 13 (gauntlets), 26 (shield), and 13 (boots). The weapons are unchanged, the Dwarven weapons were already marginally better than the orcish weapons, but now you'll be able to make Orc weapons first. Is compatible with Ars Metallica, slight quirk where you can smelt quicksilver and craft nordic arrows when you get Orcish smithing, even though Nordic equipment is supposed to be under "Advanced Armors"
Should be compatible with everything that doesn't chance the armor rating of the relevant armors, and it will work with something that does. If this is loaded after, this armor rating will take effect, if this is loaded before, the other mod will dictate the armor rating. Will probably not work with smithing tree overhauls.